Children must complete their art by 1. Prizes are awarded at 4 p.m. 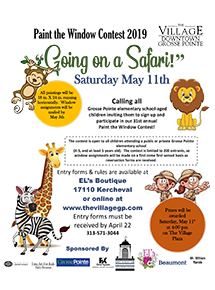 Calling all Grosse Pointe elementary school-aged children inviting them to sign up and participate in our 31st annual Paint the Window Contest on Saturday May 11. This year's theme is "Going on a Safari!" Entry forms must be received by April 22. Event runs 9:00 a.m. - 1:00 p.m. It is free to all and prizes will be awarded at 4:00 pm on The Village Plaza.